So, I'm late, but I've been busy. I'll say it now, though. Happy Thanksgiving, all! It was Toki's first Thanksgiving and I went all the way home from Boston to see my little boy. And the rest of my family too, I guess. I hadn't seen Toki in months, so I was so excited to see him. I was convinced that he had forgotten me. It turned out that he didn't, which I was so excited for. I came home and even before I made it up the stairs, I heard him start barking. Of course, he does that for everyone, so I guess it's not a big deal. My parents let him out of his room - they had picked me up from the train station and had to put him away while they were out of the house - and he came bounding right over to the gate and started jumping up and wagging his tail. Wagging his tail! Yes, that was right.... Toki rarely wags his tail, even when he's happy, so that was incredibly exciting. He wouldn't leave me alone and kept trying to play with me all night until eventually my parents decided that he should be put to sleep. The next day, I woke up to him barking at the gate to the hallway where my room is. As soon as he saw me, he started crying, and spent the rest of the day by my side again. Which was interesting, because it was the day we were getting ready for Thanksgiving and there was food everywhere! For a day, I was more important than food! It was a miracle! 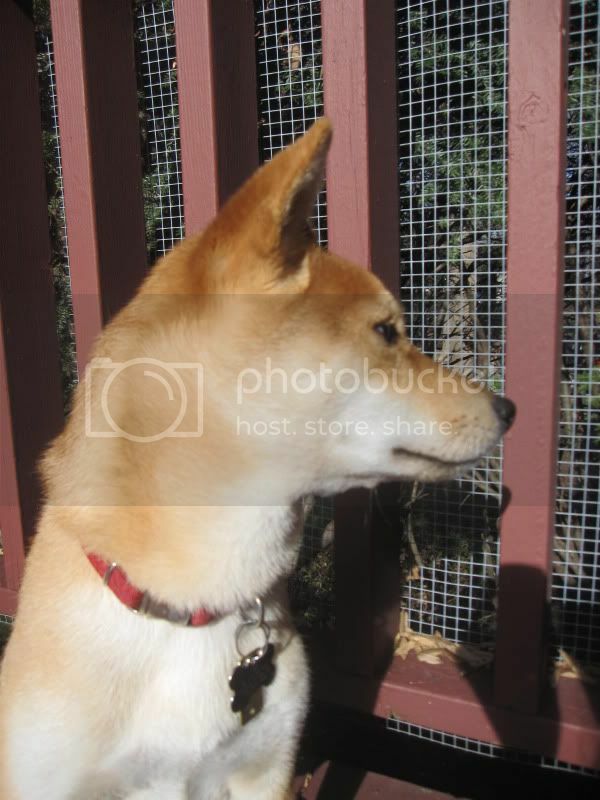 Took him to the park early Thanksgiving afternoon, saw a Shiba there - we've seen him before, and they usually got along but for some reason they just weren't having it that day - and a lot of other dogs that Toki played with. I had to chase him to get the leash back on and take him home. Something needs to be done about that park. It's so covered in leaves that some of the more disgusting, and less considerate, people have decided to ignore their dog's poop and let it sit in the leaves for unsuspecting victims to step in. They need to rake some of the leaves, get rid of some of the mess so those awful, rude people are accountable for their dogs. Anyway, he didn't like Thanksgiving as much as I thought he would, but I guess that would be expected. Toki has gotten a lot better with adults, even sometimes letting them pet him after a few minutes of them ignoring him. But kids, it seems that he has a problem with kids. I blame myself for that time a group of small children surrounded him at the park. I don't know what it is, but children scare him, even more than other people. My uncle brought his three kids: 15, 13, and 8. The 8-year-old apparently has issues with the word 'no' and was convinced that even though we said to leave Toki alone, he was growling, his ears and tail were down, and he kept running away from her that he wanted her to pet him. The logic of spoiled children amazes me. Toki got so scared that he started vomiting, so I put him in his room and closed the door before distracting my cousin with other things. Of course, we felt bad, so eventually we let Toki back out and he wandered around a bit, hiding in places my cousins couldn't reach him whenever they started getting closer. I wonder what goes through a child's mind when someone says 'no' and they are confronted with a growling puppy backing away. Normally, he likes when my family comes. They try to sneak table scraps to him. Not this time, obviously. Anyway, he stayed in his crate for the rest of the night, even after they left, but we made it up to him by giving him treats and making him feel better. The next day was my last full day home. Again, he spent most of the day with me, although he did leave my side more often than the other days, particularly after I gave him a bath. He hates bath time, but loves the afterword, when he's all clean and gets to play with the towel while I try to dry him off. Today was my last day with him. I wonder if he knows when I'm leaving? Because he was crying and barking at me again all day, spending part of the day running away from me and part of it staying as close to me as he can. I just left him today and already I miss him. But I'll be home again in about a month for the one year anniversary of when we adopted Toki. We're going to celebrate! For now, I'm back in Boston, once again on the hunt for the city's elusive Shibas. Angel came home! Angel came home! I was so happy! Angel came home! She played with me and gave me treats and fed me and rubbed my belly. She gave me a bath too, which I didn't like, but I guess it was alright because we played after that. A lot of people came one day and I didn't like that. There was a really little person who kept trying to come over to me, even though I growled and ran away. Angel put me away and sat with me for a while, so I guess it was okay. I got to spend lots of time with Angel.